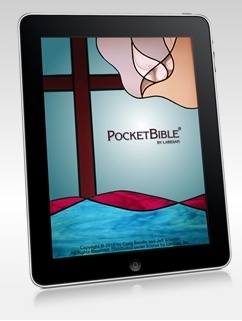 A fast iPhone bible with lots of additional free books too! Laridian’s free iPhone application Pocket Bible is a fantastic bible app to have available. It is fast to navigate around, and is helped greatly by having a good collections of other books such as commentaries, dictionaries and devotions which add an extra level to its usefulness. Compared to many other free iPhone bible study applications, the number of free books available to download is impressive, with 14 free books covering a good range of styles included. With dictionaries, commentaries, topical bibles and daily devotionals included you really can’t complain! Here is the full list available at the time of this review. There are six icons at the bottom of the screen. The first lets you decide which book to open. This is one area the Laridian Pocket Bible handles differently from many other applications, with the ability to have more than one book open at any one time (two on the iPhone or iPod Touch, 5 on the iPad). This works quite well so you can flip between a commentary or the bible by tapping the top or bottom of the screen. If you tap anywhere on the left or right of the screen you can go back or forward a page in the book you have open. A lot of the options when dealing with texts can be accessed by tapping and holding down on a verse, word or sentence of a book. In the verse menu you can take notes, bookmark, highlight or copy the verse. These all operate as you would expect, and you have choice of the colour of highlighting too which could be useful. The word menu (also found by tapping and holding) gives you the option of searching or looking up the word that was tapped. So, if you have downloaded one of the free dictionaries you can then quickly get the definition! Just under the word menu you can also choose to view a split screen with two different books (or indeed the same book twice). The other icons that are at the bottom of the screen let you search, go back to your last step, read todays daily devotion, or go to the main menu for options or to download books. There are lots of options available for playing around with the way the text and pictures are shown on the Pocket Bible. This goes beyond just changing the font size but also when menus show, whether to show Strong’s numbers, the words of Christ in red, and many more choices. Overall the design works well and is relatively intuitive as well as being fast. If I was being really picky (which it seems I am) some of the colours and graphics aren’t quite in line with the iPhone’s style. But that is being picky! Along with other good options, it is a really nice feature to be able to decide what is copied when you copy and paste. With Pocket Bible you can choose whether to include verse numbers, notes and how to delimit verses. You can even do this with HTML if you are brave, to add line breaks or anything you particularly want to! It would be great to have a reading plan for the bible available, this would fit in well with the way the devotional books are treated. I am asking men of God if you can send me some bibles and. Iphone or other litriture . Thanks. God bless you all. THANK YOU SO MUCH. I AM FROM FIJI. I AM STRONG BELIEVER OF CHRIST.CAN YOU PLIZ SEND ME A iPHONE POCKET BIBLE SO THAT I CAN GET MORE INTO THE WORD OF GOD AT ANYTIME. THANK YOU. GOD BLESS YOU.